Osteochondroses in children is a poorly understood disorder of enchondrial ossification. There appears to be a vascular deficit in the subchondral developing bone in children that is self limiting in course. 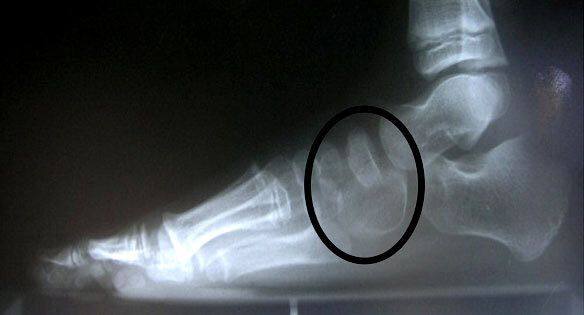 Kohler’s Osteochondroses affecting the tarsal navicular bone is uncommon in presentation in boys greater than girls, ages 3-5 years of age. Clinical presentation may appear as an antalgic gait pattern with warmth and swelling to the rearfoot and ankle region without known trauma. 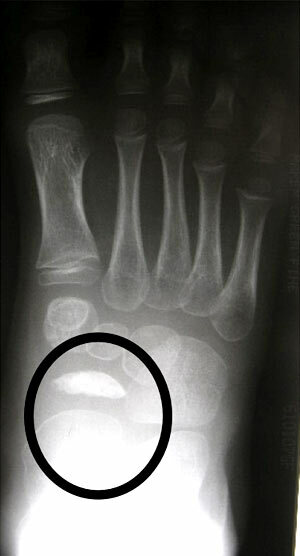 Differential diagnosis includes bone tumors, hematogenous osteomyelitis and fracture. Plain film radiographs are most commonly diagnostic of this form of osteochondroses with “coin on end” radiographic appearance of the navicular with increase bone density and sclerotic margins as compared to contralateral non involved extremity. MRI is sensitive for fluid intensity changes on T1/ T2 but unnecessary in obtaining a diagnosis. Treatment includes short term cast immobilization with advancement into supportive shoe and orthotic until symptoms fully resolve. Long term incidental radiographic findings include bipartite navicular however there are no long term documented cases of rearfoot arthritis related to this process. 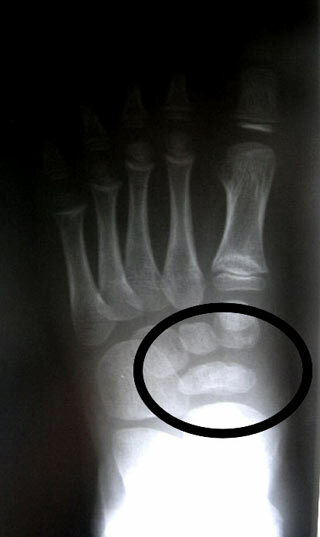 Abnormal Navicular (AP) "Coin on End"